Colombo, Sri Lanka – One person has been killed and two others wounded in Sri Lanka’s capital, Colombo, when the bodyguard of a minister in the cabinet of deposed Prime Minister Ranil Wickremesinghe opened fire at a crowd of protesters. The shooting on Sunday came as President Maithripala Sirisena, in a televised speech, announced that he had sacked the prime minister and his cabinet over economic mismanagement as well as a minister’s alleged involvement in an assassination plot against him and a former defence secretary. 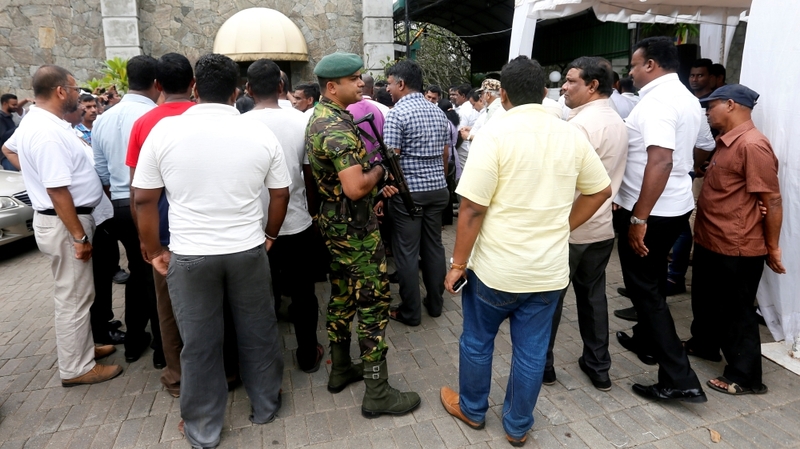 Ruwan Gunasekara, a police spokesperson, told reporters that a bodyguard working for Arjuna Ranatunga, Wickremesinghe’s petroleum minister, fired live rounds at a crowd of people loyal to Sirisena after they attempted to prevent the dismissed minister from entering his office at the state-run Ceylon Petroleum Corporation. A 34-year-old man was killed in the incident, the police said. The bodyguard was taken into custody and an investigation was under way, the spokesman added. Ranatunga, speaking to reporters, claimed his bodyguard opened fire because the crowd “was trying to kill me”. The shooting was the first incident of serious violence since Sirisena’s Friday decision to replace Wickremesinghe with Mahinda Rajapaksa, a former president accused of human rights abuses and corruption. The move, which Wickremesinghe labelled unconstitutional, has plunged the Indian Ocean nation into a constitutional crisis. In his speech on Sunday, Sirisena “categorically rejected” claims of unconstitutionality, saying he had no choice but to remove Wickremesinghe because of the alleged assassination plot. The president did not name the cabinet minister involved in the alleged plan, but said there has been “tremendous pressure on the investigation” and that investigators had “evaded their duties”. A police informant was arrested over the case last week. “Under these political problems, economic troubles and the strong plot to assassinate me, the only alternative open to me was to invite former President Mahinda Rajapaksa and appoint him as prime minister to form a new government,” he said. Rajitha Senaratne, spokesman for Wickeremesinghe, dismissed the allegations as “bogus”. The developments mark a dramatic fallout for Sirisena and Wickremesinghe, who joined forces ahead of a 2015 election to defeat Rajapaksa, who ended Sri Lanka’s 26-year long civil war against Tamil separatists. 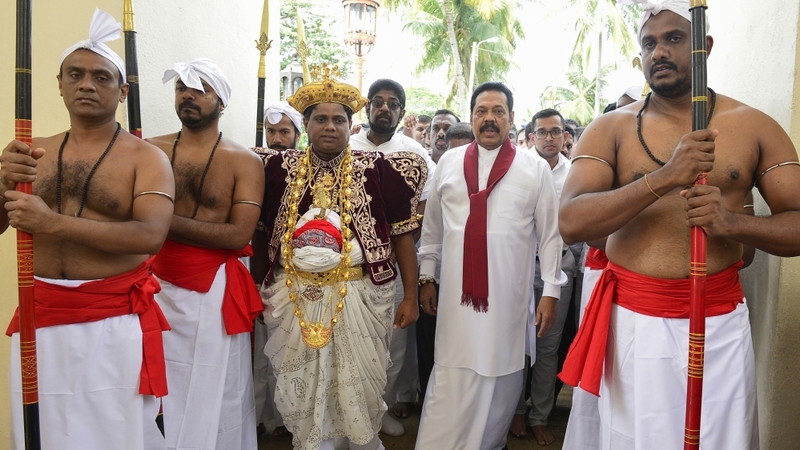 Rajapaksa – who travelled to a venerated temple in central Kandy district to seek blessings from monks on Sunday – issued a statement pledging to hold long-delayed provincial polls and call general elections “as soon as possible”. His return to government, however, has prompted concern, with Human Rights Watch saying the move has “raised fears of a return to past abusive practices in the country”. Meenakshi Ganguly, the New York-based rights group’s South Asia director, noted Sirisena came to power promising good governance and accountability for alleged atrocities committed by Rajapaksa’s government at the close of the country’s bloody civil war in 2009. “Sirisena made that promise to the victims of the war, to the Tamil people. And now in this surprise move, he has brought back the very person he ran against,” she said. Journalists at state-run media have alleged intimidation from Rajapaksa’s supporters, and AFP news agency said loyalists of the former president now control the headquarters of two state-run television channels. Wickremesinghe, meanwhile, refused to vacate the prime minister’s official residence as a Sunday deadline set by Rajapaksa’s supporters passed. Instead, he held meetings with allies at the colonial-era Colombo residence as hundreds of supporters, including Buddhist monks, gathered outside in a show of support. Police chief Pujith Jayasundara, citing Sirisena’s decisions, withdrew the prime minister’s security detail from Wickremesinghe and assigned 10 officers to ensure his safety, according to an official memo. The removed prime minister is now calling for an emergency parliament sitting to prove he still has a majority. According to the website of Sri Lanka’s parliament, Wickremesinghe’s UNP has 106 seats in the 225-member House, while Sirisena’s United People’s Freedom Alliance (UPFA) has 95. Two UNP MPs have defected to the UPFA since the crisis began. But Sirisena has suspended parliament until November 16, in an apparent bid to shore up support for Rajapaksa’s appointment. Observers described the move as “undemocratic”. Speaker Karu Jayasuriya, a UNP member, also condemned the decision in a letter on Sunday, saying it had “serious and undesirable consequences” for Sri Lanka. Jayasuriya said he supported Wickremesinghe’s appeal to retain the rights and privileges of the prime minister’s office until another candidate could prove a majority. “I consider the said request to be a democratic and fair request,” he said in the letter. Western countries, including the United States, the United Kingdom, Germany and France, have called on all sides in the crisis to respect the constitution and refrain from violence. Neighbouring India said it was following events in Colombo closely.